While in San Diego, a large group of us had dinner at Osetra in the downtown GasLamp Quarter. This was my first trip out to this neighborhood and our short walk there and back to our hotel gave me the impression that the GasLamp Quarter is quite a vibrant urban scene at night. The restaurant itself is quite elegant with a contemporary lounge area downstairs. Upstairs, a large table was ready for us with a window view. The service was impeccable; the staff was more than accommodating when someone in our party showed up with two extra guests we hadn't included in our reservation (this was a busy Friday night), and their willingness to separate our checks was also much appreciated. Being that I was under the weather, I didn't have much of an appetite, so I was only going to order an entree with no appetizer, dessert, or wine. Even so, the extensive menu made this a very difficult task. After juggling a number of equally tempting options in my head, I decided to order the Mahi Mahi; the lobster mashed potatoes was what won me over. The fish itself is marinated in a citrusy concoction and pan seared, served with a lemon brown butter emulsion, roasted almonds, and French green beans. I loved every bite of this and despite lacking my usual appetite, cleaned my plate in a matter of minutes. 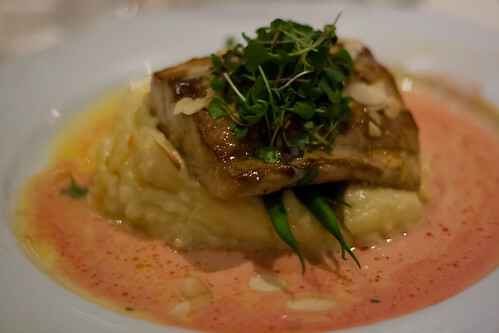 The mahi mahi was cooked perfectly as the meat was soft and moist and the citrus flavor was evident, while the lobster mashed potatoes were savory and delicious. It was overall a fabulous dish. Everyone who sat around me loved their food as well. As with service, the food was a definite two thumbs up. As a side note, even though Osetra is primarily a seafood restaurant, the owner also owns a steakhouse nearby and Osetra gets their meats from the steakhouse, so their steaks are allegedly high-quality as well. I did note two oddities about Osetra, though they are not complaints. First, when my friend made a reservation for our group of 12, she had to guarantee it with a credit card that would be charged $50 for each no-show. Is this a "San Diego thing"? None of us had ever heard of this policy before. Second, while Osetra has an upscale feel and an upscale price point to match (at $29, mine was one of the least expensive entrees on the menu), you might think that their music of choice would be something to the effect of smooth jazz or classical? But you'd be mistaken. Sometime during our dinner, a salsa band showed up downstairs to cover American pop music, which was a little unusual, in my opinion. I found out later on Osetra's website that this is part of their live music event on weekends, so I'm guessing it is really meant for the lounge crowd rather than the dining crowd, but the second floor is an open loft so we most definitely got a loud dose of the music. Perhaps this is another "San Diego thing," or more specifically, a "Weekend in GasLamp Quarter thing." I say this because I was out for dinner in this area again the following evening and noticed two Mexican restaurants next to each other, both blasting impossibly loud dance club music, not to mention the general party scene all over the streets of the GasLamp Quarter. I guess the moral of the story is that one should expect loud music everywhere in this neighborhood on the weekends, even at places where you might not normally expect it, and the style of music you get may not be what you'd expect either. Nevertheless, I greatly enjoyed my time at Osetra with great company. I didn't know what to expect of Osetra at the beginning of the evening as this wasn't a restaurant for which I specifically had a recommendation, but I am so glad to have been pleasantly surprised by the amazing food and attentive service.